Nineteen years ago on December 6, 1990, Polingaysi Qoyawayma (Elizabeth Q. White), passed away with family at her side in Phoenix, Arizona. 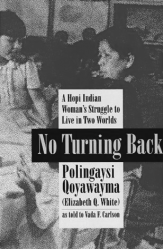 Born in 1892, Polingaysi was from the village of Orayvi on T hird Mesa, and she is perhaps best known for her book (as told to Vada Carlson) No Turning Back: A Hopi Woman’s Struggle to Live in Two Worlds. I never had the honor of meeting Polingaysi, but her story is often told among our people. In November 1906, shortly after an internal dispute in her village, Polingaysi left by wagon with a group of Hopi children to the small town of Winslow, Arizona. From there she boarded a Santa Fe train to San Bernardino, California, then traveled south to Sherman Institute in Riverside. She experienced a different life in the “land of oranges,” and she wrote at length about her time at Sherman in No Turning Back. After spending almost three years at the school, Polingaysi returned to Orayvi and found it difficult to acclimate to reservation life. She eventually became the first Hopi to teach at a Hopi day school, and she encouraged her students to take the best of Hopi and American culture to succeed as a people. Although Polingaysi is often associated with No Turning Back, she also wrote a second book in 1941 titled The Sun Girl, which was illustrated by Hopi artist Komoki. In this children’s book, Polingaysi retells a story of a young girl named Dawamana (“Sun Maiden” or “Sun Girl”) from Orayvi who learns the Butterfly Dance at the village of Moencopi. In the foreword to the book’s 1978 edition, Robert Breunig of the Museum of Northern Arizona notes that “Mrs. Qoyawayma told this story many times to her school children. They became so enthralled with it that they asked that it be repeated again and again, and they learned it almost word for word, correcting deviations from one telling to the next. Finally, Mrs. Qoyawayma wrote the story down in the hope that all children would enjoy it.” Nineteen years after her passing, Polingaysi’s life and work are still remembered. She is one of the most revered teachers and writers in Hopi history, and her example and words continue to have great meaning and relevance for those in the present. Years ago I read NO TURNING BACK, and I recommend it for young adult readers. I’m really glad to learn that Qoyawayma wrote a book for younger children. I’ve ordered a copy and look forward to reading it. I remember the many nights I spent listening to Polingaysi “Butterfly among the flowers” speak around a campfire next to her house in New Oraibi. She called me “The Dog Person” because I always had the village dogs around me. The stories she told us about the air, the earth, the corn I will never forget. One afternoon I drove her into Winslow to get supplies. We were rebuilding her house which had burned down. I was playing a Cat Stevens 8-track and the song “Old man/Young Man” (I can’t remember the exact name) was playing. Elizabeth (Polingaysi) started crying and started talking about the blessing of a long life.. I can’t remember exactly what she said but as a 17 year old, I was profoundly moved. So lucky to have known her. Where can I find/view/purchase your movie? oh goodness, right here..missed it, sorry..
My dad, Roy Bates was a personal friend of Elizabeth Q. White and was welcomed on weekends from his job in Flagstaff, Arizona, to the Mesas. He was also a friend of Alfred Joshong, husband of Ruth and father to Thurman. Elizabeth White taught dad to make a traditional pot, Hopi style as thanks for his help in modernizing her studio in Old Oraibi,after she retired from teaching. It is a beautiful pot that is displayed in my home. Looking at the pot, you can tell who the teacher was , since the blended sands that Elizabeth selected were uncannily similar to those that she made, and displayed in many museums in the Southwest. Found this link to Polingaysi Qoyawayma and could not resist sharing a bit of history about my dad’s connection to this amazing woman. No problem, Paul. There are a few different websites where people can purchase the film, but going through the 716 Productions/Learning Who We Are link that’s on my blog is the least expensive option. Also, just to let you and others know, Beyond the Mesas will be shown several times on the internet later this month. I will make a blog post about it next week. For more information, go to the “Showings” page on my blog and read the UI-7 showing blurb. After reading Polingaysi Qoyawayma’s book i was also profoundly moved. I am a music teacher to small children and her ‘natural way’ of insidious teaching – where students were so interested they didn’t realize how much they were learning’ is a definite part of my teaching as well. Her story was not only educational but touching and I think brought home the true nature of the Hopi culture and symbolism – which I was not aware of being a mixed race cauacsian…(plain white guy….Teh song paul is referring to is ‘Father and Son’ from Cat Stevens….Thanks -I would have loves to have checked out the movie as well….You are doing meaningful work Gilbert…. Thanks, Nate, and please forgive me for taking so long to respond to your comment! A lot of work has yet to be written on the life of Qoyawayma. She had a remarkable life and influence on education among the Hopi. And I agree with you that her story has touched the lives and hearts of many people. Thanks again! I’m honored you even responded – all the best to you – and kudos to you for your work to chronicle Ponlingaysi’s thoughts and life. As a child I met Mrs. Elizabeth White at my Great Aunt Laura’s home in Huntington Park, CA. Aunt Laura was officially adopted by the Hopi at Oraibi for her work with the service personnel during the Second WW. Mrs. White gave me a signed copy of “The Sun Girl”. Mother, Aunt Laura and I took a young man named Calvin home to Second Messiah after a serious injury while in the service. His sister made me a lovely Kachina to thank me. I treasure the memories and the book today as I’m about to celebrate my 78th Birthday. Gra, thanks so much for comment. I really appreciate your story. 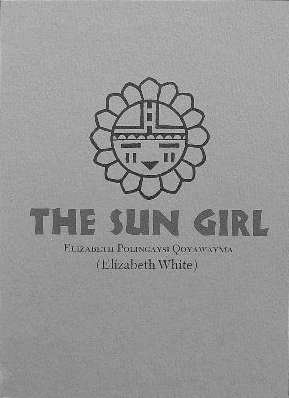 Qoyawayama’s “Sun Girl” is one of my favorite Hopi books. Matthew, please see my notes on Polingaysi Qoyawayma (Elizabeth Q. White) .that I just posted. My dad was a personal friend and Elizabeth taught him to make a traditional Hopi pot. I have her correspondence in her own handwriting in which she states that she has changed her name to Polingaysi Qoyawayma. It is dated December 3, 1981. Thought I would share a connection that most people were not aware of. She generously taught dad to make this pot since he helped to modernize her studio after moving back to Old Oraibi. Good Day all, My father first met Elizabeth when he was a Boy Scout during the depression. When I was about 9 years old about 1949 we stopped and stayed with Elizabeth, In the morning while everyone was eating breakfast I took some luggage out to the car. Met a rattle snake in the drive. The woman came out and chopped it up with a hoe saying come see the devil, come see the devil. I still have the rattles. My parents used to stay in Hopi Land in the winter, father worked with Charles Loloma. I have one of Charles first attempts at jewelry a pendant. It was given to Elizabeth who in turn gave it to my father. Elizabeth and her sister Ida used to stay with my parents in Mesa when they needed to go to Phoenix for any reason.